The death toll in wildfires sweeping California has risen to 31, with more than 200 people still unaccounted for, officials have said. 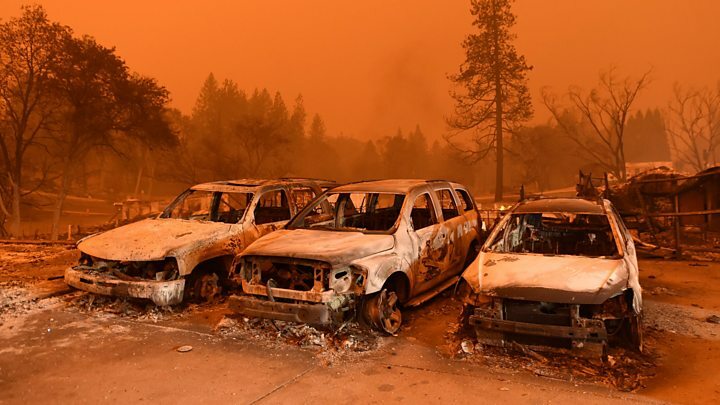 Six more people were confirmed killed in the Camp Fire in the north of the state, taking the toll there to 29. It now equals the deadliest wildfire on record in California – the 1933 Griffith Park disaster in Los Angeles. In the south, the Woolsey Fire has claimed two lives as it damaged beach resorts including Malibu. With strengthening winds threatening to spread the flames, state Governor Jerry Brown has urged President Donald Trump to declare a major disaster, a move that would harness more federal emergency funds. The appeal came a day after Mr Trump threatened to cut funding for California, blaming the fires on poor forest management. The town and surrounding area bore the brunt of the inferno, which started in nearby forest on Thursday. At a news conference late on Sunday, Butte County Sheriff Kory Honea said the bodies of five people had been found in their burned-out homes and a sixth was found inside a vehicle. He said that more than 200 people were still unaccounted for. The mayor of Paradise, Jody Jones, gave the BBC an update on the situation in the town. The fire is the most destructive in the state’s history and the joint deadliest. It has burned more than 109,000 acres (44,000 hectares) and is nearly 25% contained, fire officials said. What about the Woolsey Fire? The blaze started on Thursday near Thousand Oaks, about 40 miles (64km) north-west of central Los Angeles. 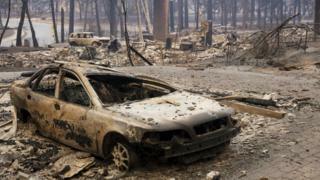 By Sunday it had consumed 83,000 acres and destroyed at least 177 buildings, officials said. It is only 10% contained. The smaller Hill Fire, nearby, has scorched 4,530 acres and is 75% contained. Some looting was reported in the southern fire area over the weekend and police said arrests had been made. Luxury homes in Malibu and other beach communities are among properties that have fallen victim to the flames. Firefighters used a respite from strong winds on Saturday to drop fire retardants to strengthen firebreaks. But officials warned against complacency, with winds of up to 70mph (112km/h) expected over the coming days. They said fires could spread quickly and unexpectedly. “Winds are already blowing. They are going to blow for the next three days. Your house can be rebuilt but you can’t bring your life back,” said Los Angeles County fire chief Daryl Osby. Meteorologist David Gomberg told the Los Angeles Times newspaper that fire tornadoes were possible. Governor Brown’s request to President Trump was aimed at bolstering the emergency response to what he called the “catastrophic” nature of the wildfires. “We’re putting everything we’ve got into the fight against these fires and this request ensures communities on the front lines get additional federal aid,” Mr Brown’s letter said. Mr Trump’s response to the fires has been criticised as unsympathetic and ill-informed. He has previously blamed Californian officials for wildfires and threatened to withhold federal funding. In a tweet on Saturday, he accused state authorities of “gross mismanagement” of forests. Mr Brown’s spokesman, Evan Westrub, called Mr Trump’s comments “inane and uninformed”.